— Here, we see Nodoka as a young(er) kid. Obviously, I knew she wasn’t a natural blonde. I’ve always heard it was bad for your hair to bleach it all the time, though. Also, she had brown eyes back then, which means she must be wearing contacts now. — So what’s in Mai’s cabinet? 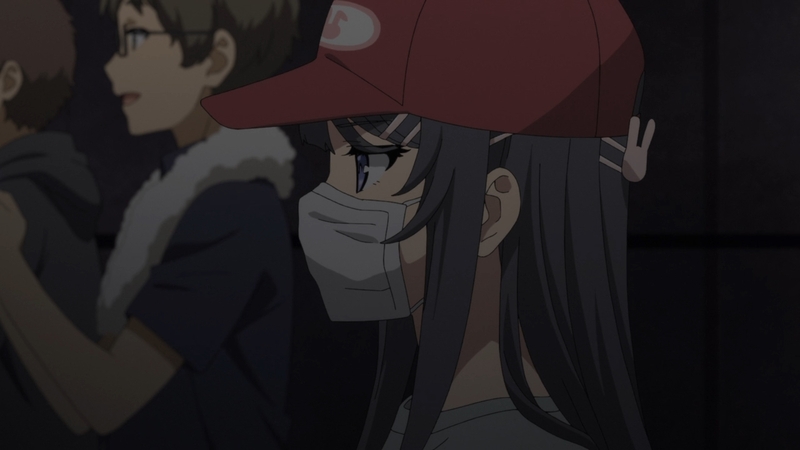 Judging by Sakuta’s reaction, it’s nothing alarming, but we still don’t really get to know what it is. All we get to see is a tin can. Well, unless we’ve seen this tin can before or something, and I’ve just forgotten. 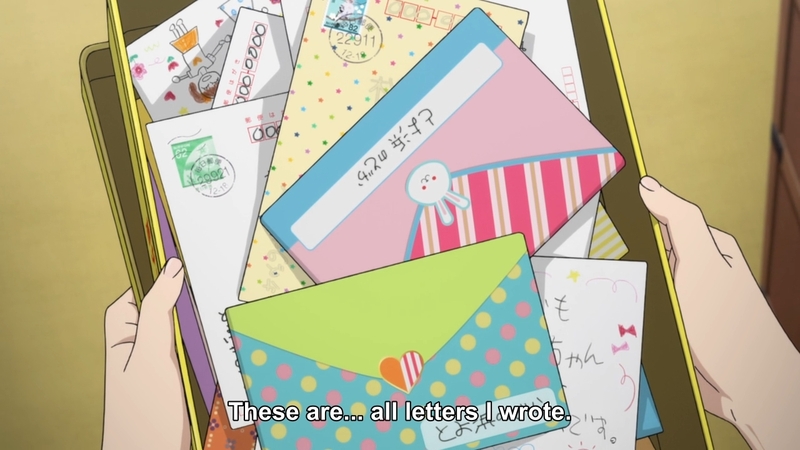 Knowing how cheesy anime can be, however, it probably just has letters from her sister. — In the meantime, the guy continues to keep Nodoka company… by helping her study her big sis’s movies. Huh, didn’t know Mai also did horror movies. — It seems like he’s not even looking at Nodoka here. 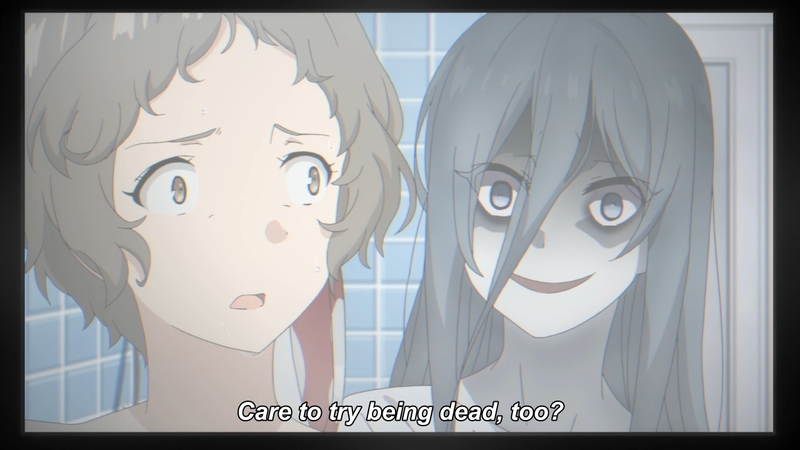 — Nodoka proceeds to ask Sakuta to stay a bit longer, ’cause she’s afraid to bathe alone. Needless to say, the guy jokes that he’ll only stick around if he can bathe with her. 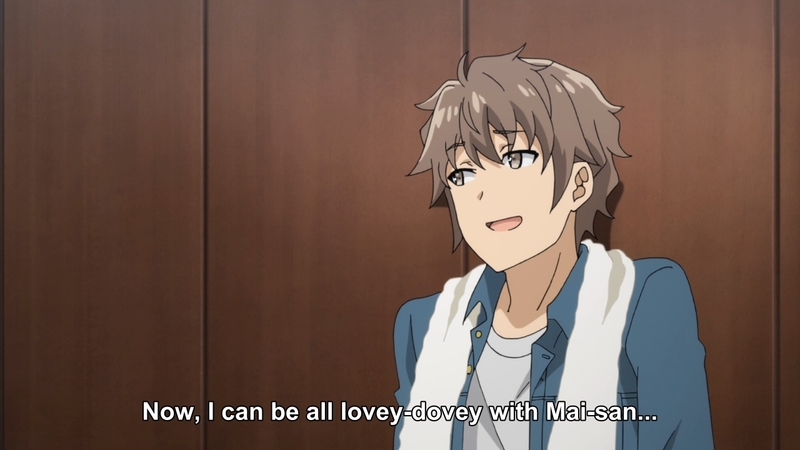 So it’s Nodoka in Mai’s body, but at the same time, he’ll only be looking at Mai’s body. Only scholars can decide if this is cheating. 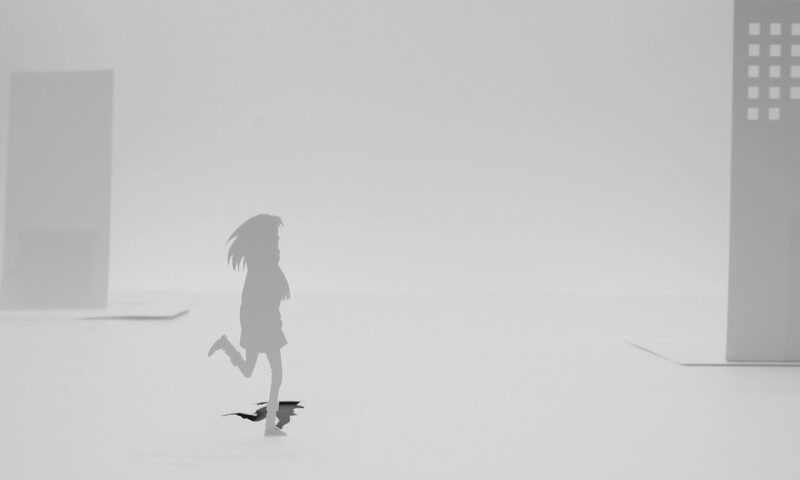 — The animation in this week’s episode is… um… yeah. — Anyways, when the guy gets home, he discovers that Kaede might finally be ready to rejoin the real world. I hope she does, because I think being cooped up in the apartment everyday is slowly turning her crazy. But oh no, the real world is full of internets! Can the girl handle this?! 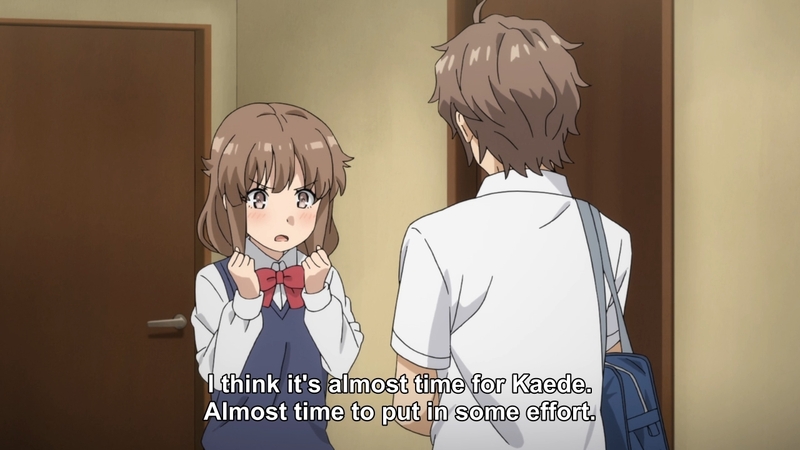 — Then again, Kaede only feels like shaping up because Sakuta keeps befriending more and more girls. Meh. — Mai shows up with tickets for the upcoming concert. She even has one for Nodoka and her mother. It feels like we’re playing with fire. Let’s say Mai hits it out of the park. 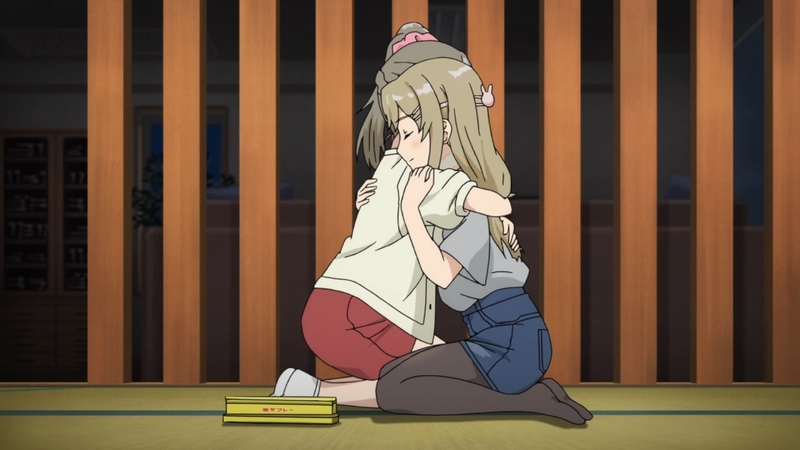 Nodoka will then be forced to watch as her mother praises Mai. That won’t help her inferiority complex. — We eventually go back to hanging out with Nodoka. She’s in a grumpy mood because it apparently took her twelve takes to pull off a simple scene. Then again, this sounds like it’s her first time acting. Eh, I dunno. I still don’t really empathize with the girl. I’m just here to see how this all resolves itself. — She says she can’t live with all this pressure, so she doesn’t think she wants to be like Mai anymore. But to be fair, she’s in an unfair situation. I doubt Mai jumped headfirst into all of this. Rather, she slowly build her career up from the ground level. — Oddly enough, Mai calls Nodoka in order to get in contact with Sakuta about his dad. I almost forget that his parents still exist. If you think about it, they’re pretty terrible parents. Sure, his mother’s condition demands attention. But letting a kid raise his sister by himself? C’mon, man. Parents are only human; parents can make mistakes, too. But the fact that there seems to be no end to this current situation seems untenable to me. — Afterwards, Nodoka tells Sakuta that even though she no longer wants to be a big movie star like Mai, she still enjoys being an idol. 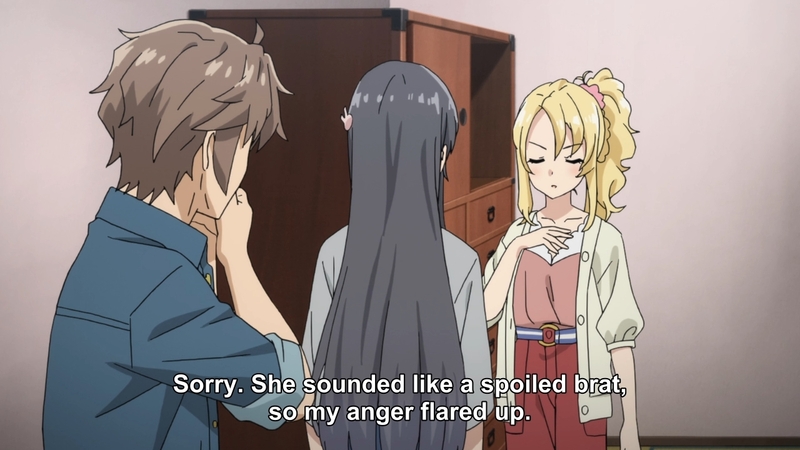 — She then asks Sakuta if he hates his parents for forcing him to shoulder all this burden. Naturally, the guy says he doesn’t. Maybe he used to have ill feelings towards them, but not anymore. Either way, he simply tells her that they’re his parents, so he can’t resent them. That makes him more magnanimous than me, ’cause I sure as hell wouldn’t be okay if I was in his situation. 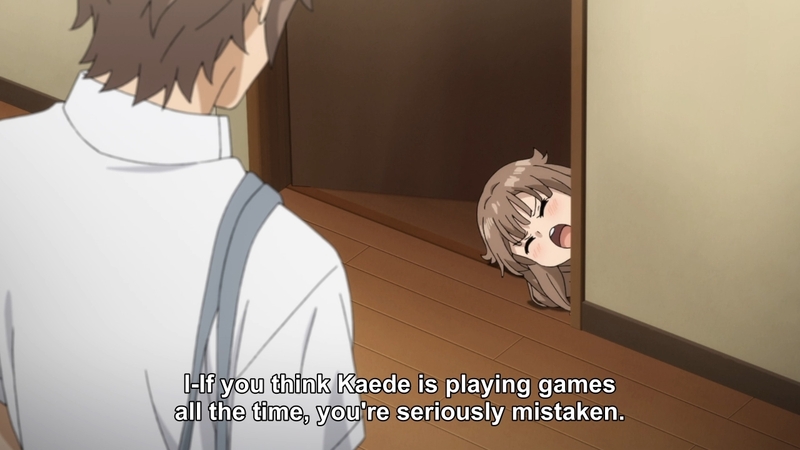 — Plus, this makes Sakuta resemble the average protagonist a little too much. Y’know, the type to shoulder every burden and still smile. The type that will drop everything at the drop of a hat to help others. It’s just not as interesting anymore when you’ve seen the same archetype for the billionth time. If he had lashed out against his parents, I would feel as though he’s a little more flawed and thus human. 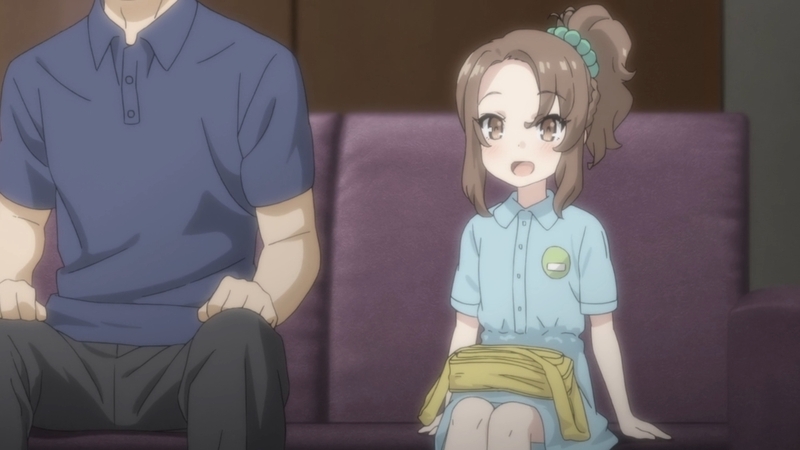 — Welp, looks like we won’t have to wait until the concert in order to bump into Nodoka’s mom. She’s right here! — Unfortunately, the conversation is brief. The woman just wants Nodoka back. No explanations, no discussion, no nothing. 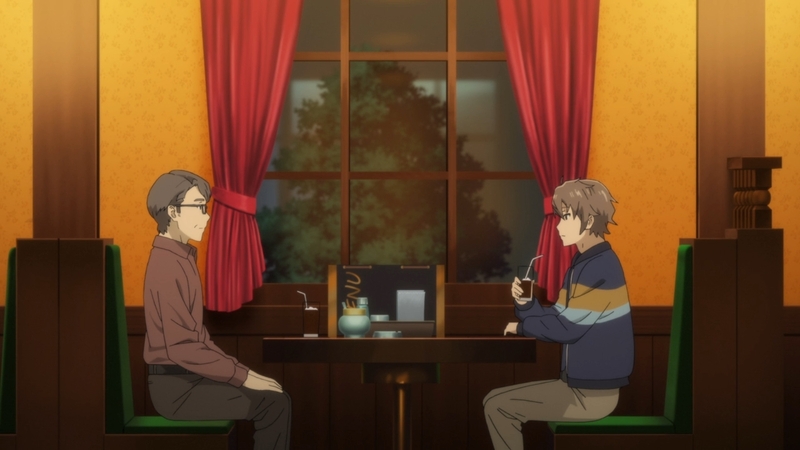 — So instead, we get to watch an awkward encounter between Sakuta and his father. — “How does it feel to be a parent?” “You’ll find out when you become one.” Thanks for the life lessons, pops. 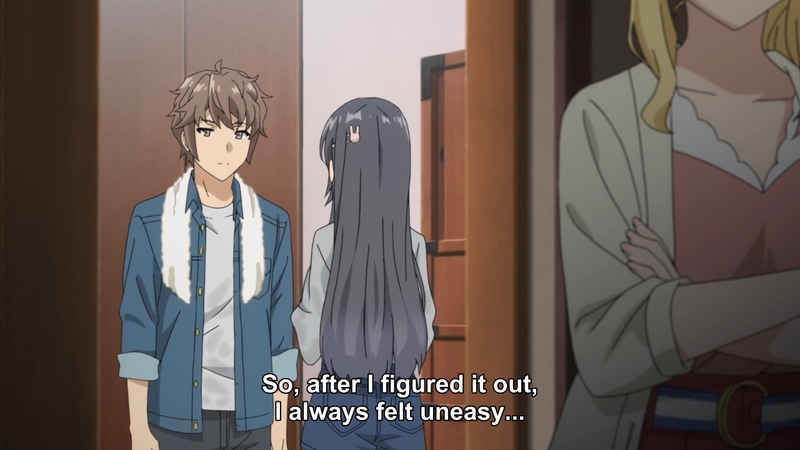 He does eventually open up about how scared and tired he was when they first had Sakuta. I dunno why he wasn’t just upfront with his son from the start. 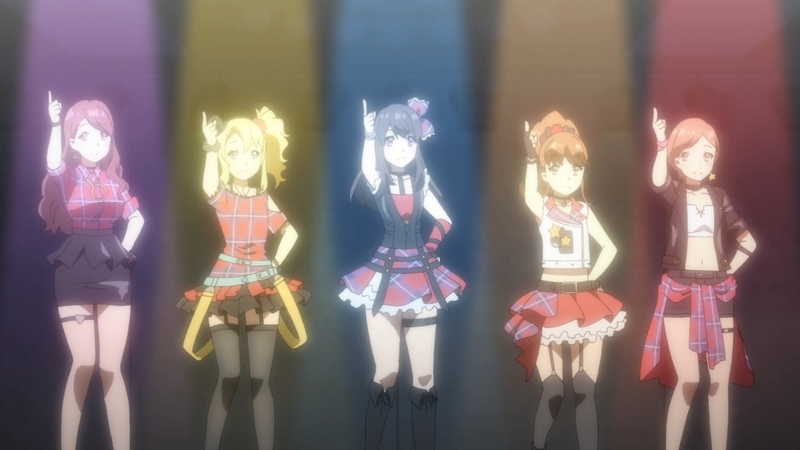 — Finally, it’s time for the idol concert. More specifically, it’s time to mute the audio. 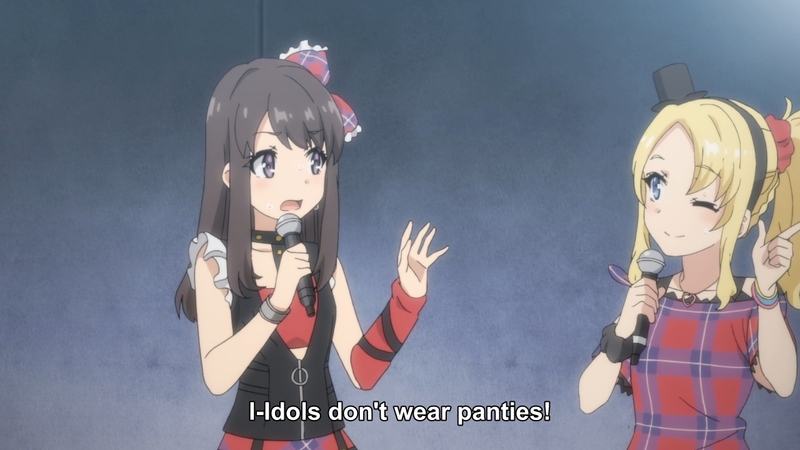 — Apparently, this idol group doubles as a comedy troupe. — Oh no, they’re singing. Back to the mute button. — I mean, I would watch an indie rock group trying to claw their way from the bottom up. 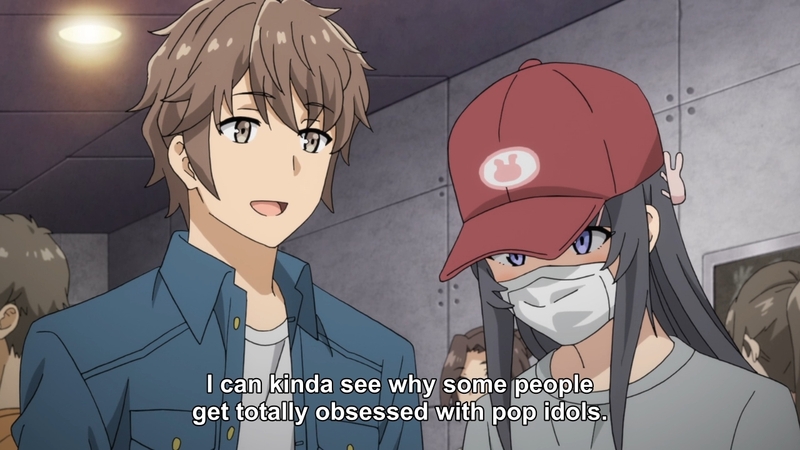 I just have no interest whatsoever in idol music. 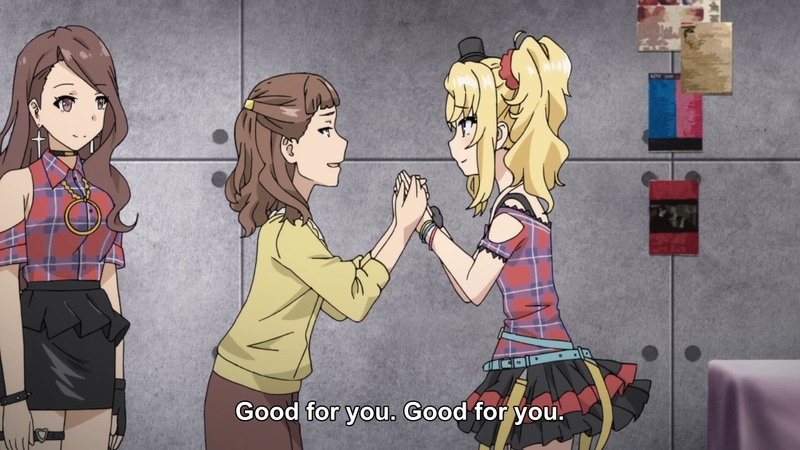 I wouldn’t say I dislike jpop (or pop in general), but idol music in particular just… yeah, it’s not pleasant to my ears. — The group ends up announcing that Nodoka will be the featured member on their next single. So if the sisters can swap back now, Nodoka will get her wish. If. She looks crestfallen, though. — I guess the issue here is that Mai is doing as an awesome job as Nodoka, but Nodoka can’t cut it as her big sister. But we can’t really pinpoint the exact reason why this is, because we don’t know the girl that well. So far, we’ve only spent one and a half episodes with Nodoka, and that’s not enough for me to say whether or not she’s working hard enough to achieve her dreams. Maybe Mai is naturally more talented. Or maybe Nodoka just has too much baggage preventing her from focusing on her career. I can’t really say. I feel like we just got rushed into this story, and now we’re rushing back out as quickly as it started. — Maybe she gets more character development in the light novels. If that’s the case, then the adaptation trying to cram this many novels into a one-cour series only serves to do these girls a disservice. But I’ll never read the books, so I’ll never know. — Too bad I don’t. — Well, it looks like Nodoka’s mom is proud of her… but it’s still Mai in her body. So the girl feels like her big sister is achieving all of her dreams without her. — So at Nodoka’s request, Sakuta takes her to beach. It’s the happening place. Every girl has stopped by this beach. Hell, he even met Shoko in the past at this beach. — The girl then foolishly walks into the ocean as if she wants to drown herself. 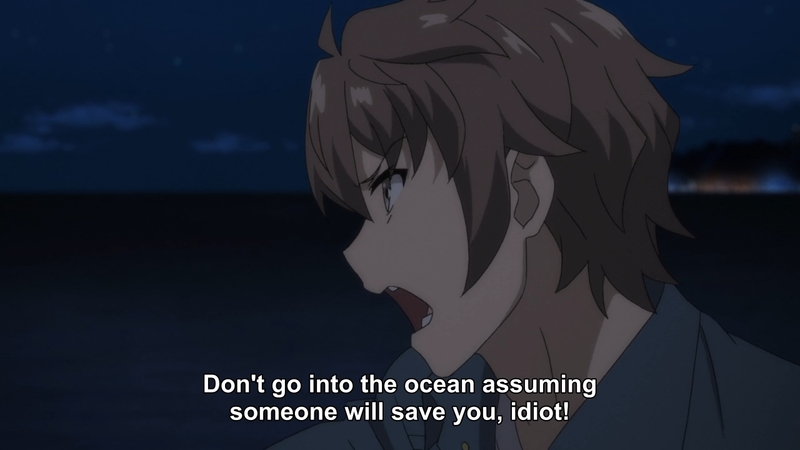 She can’t be dumb enough to think that Sakuta would just let her die, though. “Welp, there goes my girlfriend’s imouto in her body!” So this is just a cry for help. 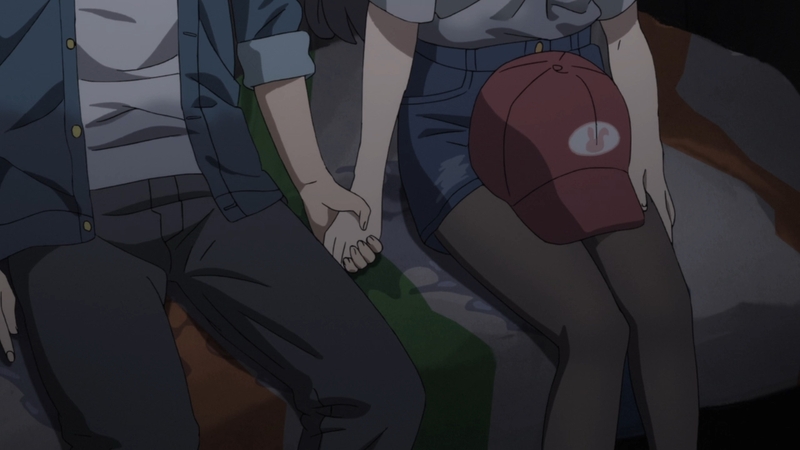 — Sakuta insists that Mai doesn’t hate Nodoka, and he has proof. That proof must be in that tin can. Either way, it’s possible to love and hate someone at the same time. But people can get gunshy about the word “hate.” People think that the word is too strong of an emotion. So you can always reframe it as feeling conflicted. 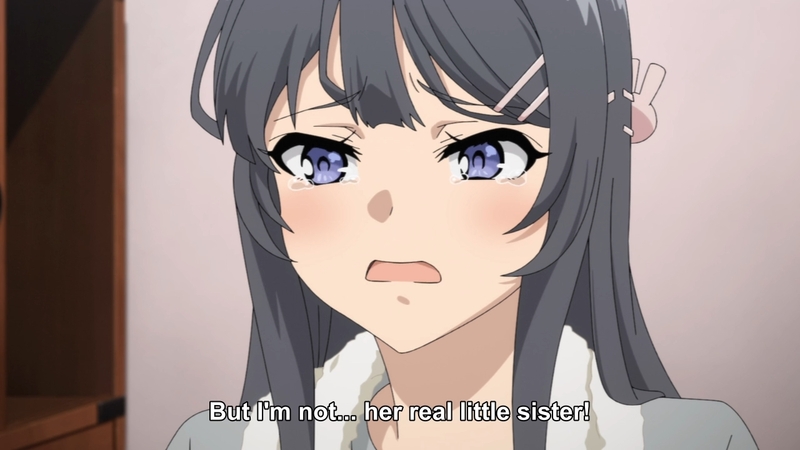 Yes, Mai loves her imouto, but at the same time, she’s conflicted. It’s always complicated dealing with a girl who is the product of your father’s cruel actions. Personally, I don’t mind using the word “hate,” because as I see it, it’s possible to feel two opposing feelings at the same time. 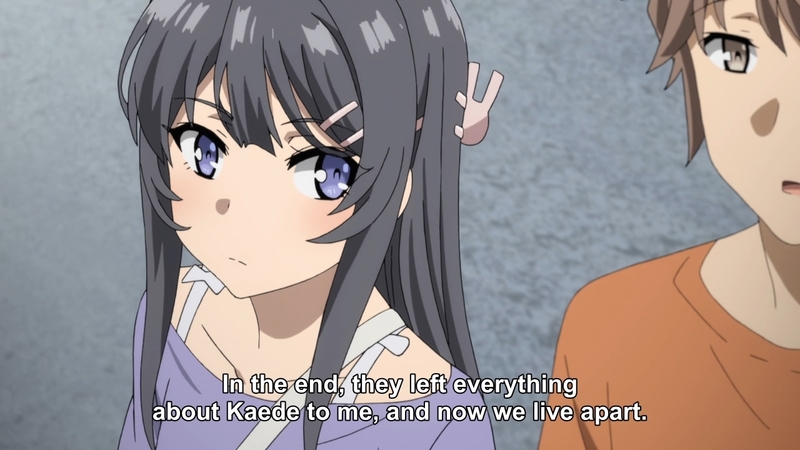 But if Sakuta wants to argue that Mai doesn’t hate Nodoka, that’s fine too. Do whatever it takes to solve this problem. — They’re still holding hands. Hm. — I don’t know what I expected. 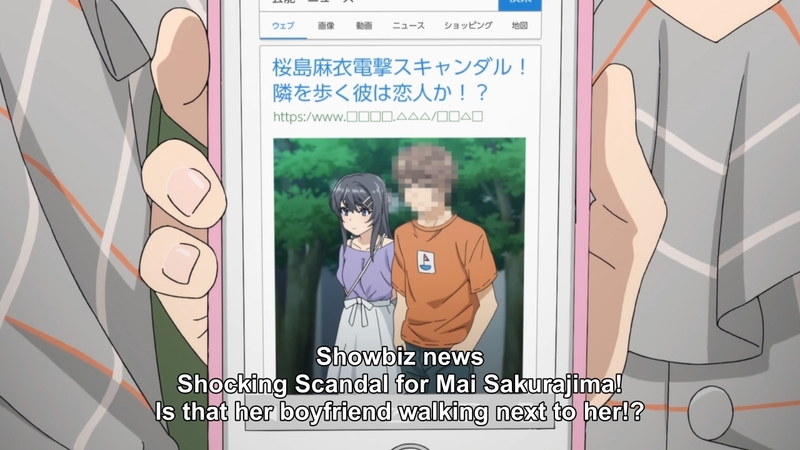 Still, even though Mai told her boyfriend not to snoop, she knew he would. And if Nodoka ever claimed that Mai never loved her, she knew Sakuta would fall back on these letters. 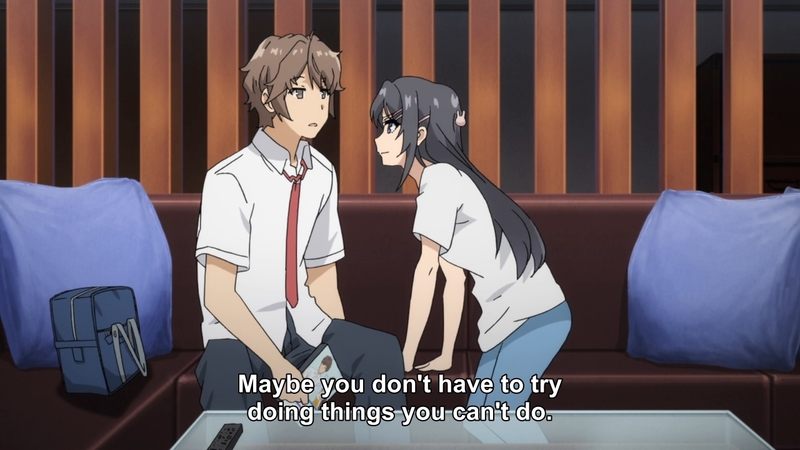 This is just her roundabout way of telling him what to do, because she doesn’t want to outwardly admit that she wants to mend her relationship with Nodoka. Kinda exhausting, but whatever. — Well, look who’s home. — So Mai is great, because she works hard. But she only got her work ethic because her lil sis was encouraging her. Now everyone go awwww and hug for our Hallmark moment. — But even now, Nodoka resists the Hallmark moment. She instead complains about the fact that Mai can achieve everything. 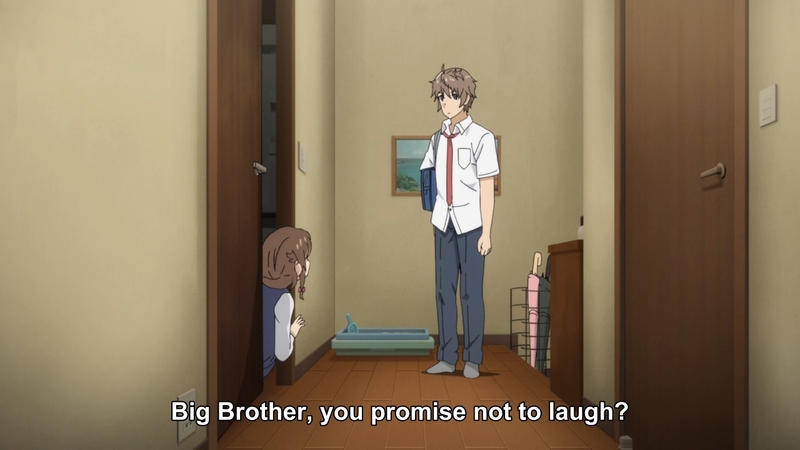 This pisses big sis so much that… uh, she slaps her boyfriend? 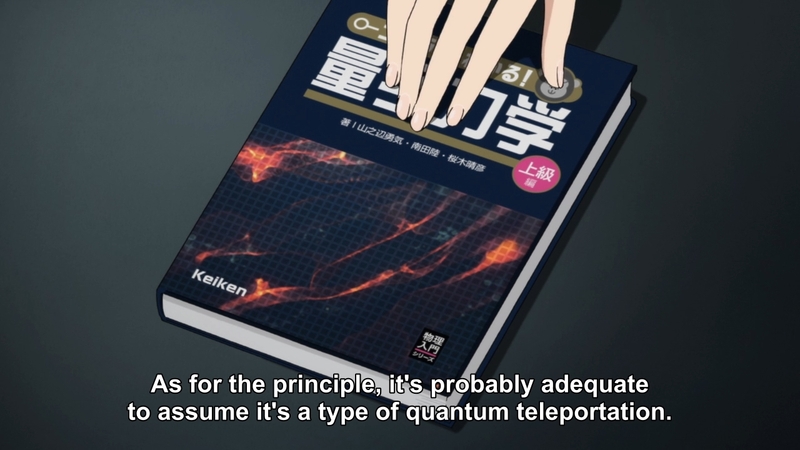 But this is kinda why I can’t empathize with Nodoka. 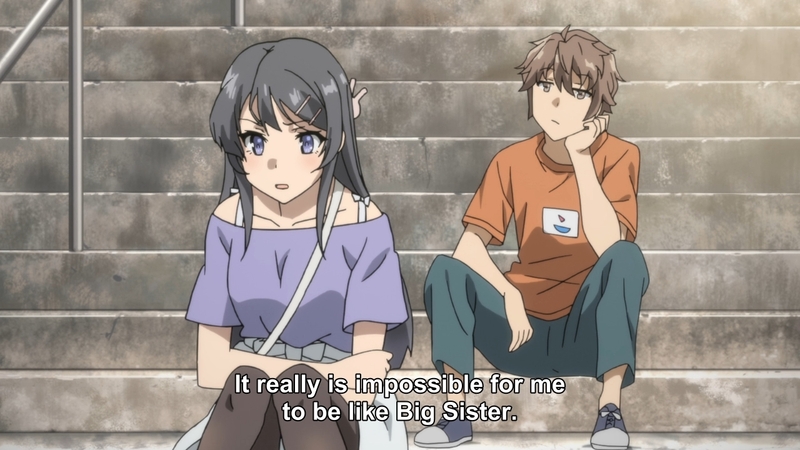 Even Mai recognizes that her sister is being entitled and whiny. 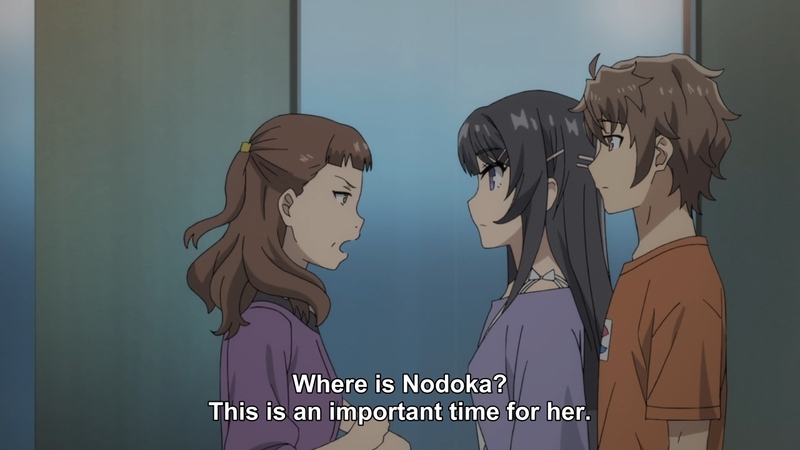 — Both Mai and Sakuta proceed to tell Nodoka that her mom is worried about her happiness too. That’s fine, but I wish she could’ve talked to her mother herself. I wish they could hash their problems out directly instead of having her hear second-hand information. Her mother is one of the reasons why she has such a huge inferiority complex. 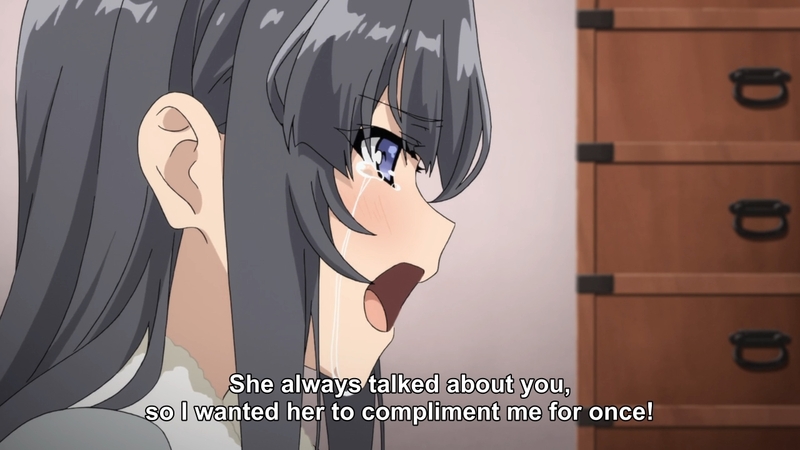 Her mother constantly comparing her to Mai is one of the reasons why she is suffering right now. So for this chapter to end without the girl having a heart-to-heart with her own mother seems… I dunno, it seems weak to me. I guess we can assume that the girl will have that talk with her mother offscreen, but why I assume it when I can see it directly? People will claim that Nodoka’s story is worth hearing because it’s well-written. I honestly cannot agree. Like with Rio, I feel like we’re skirting around the real issues. — Wow, that was awkward: all of a sudden, the two sisters literally change back into their correct bodies. You can see them in mid-transition. This means that they never swapped bodies. Rather, their bodies turned to look like the other person. 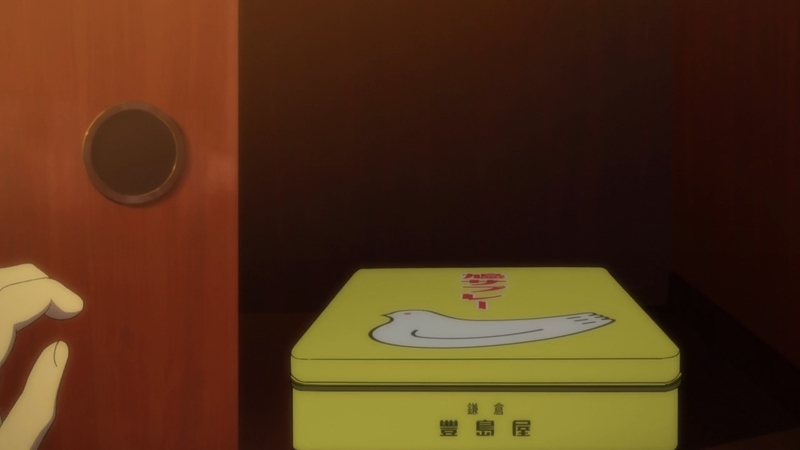 Uh… you wouldn’t surprise me if you said that the Heartseed is somehow involved. — Not so fast, my friend! — ‘Cause right after the credits, we learn that Nodoka is moving in with her big sister. — Not only that, the paparazzi is up to no good again. I’ll never understand people devoting any attention to a celebrity’s personal affairs. Get a life, you guys. 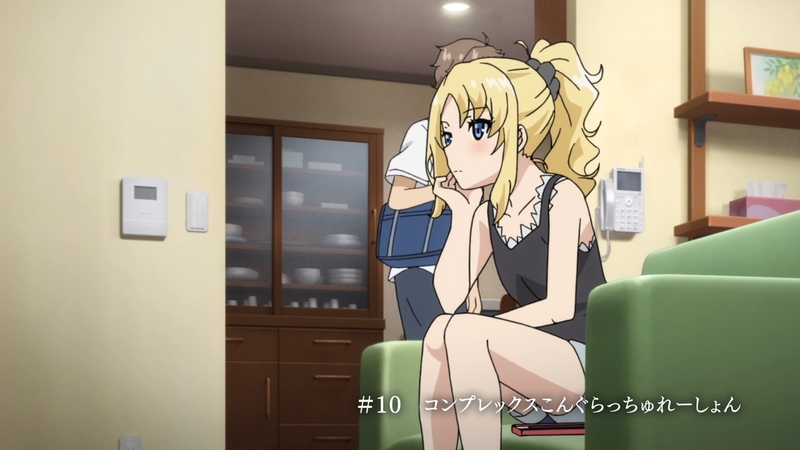 Next PostNext Kishuku Gakkou no Juliet Ep. 10: No collusion!